In this release, we gained 22 new commands, 7 new contributors to the dbatools master repository for a grand total of 46! We even added a couple new Major Contributors to the team. Thanks to all who have joined in to make the awesomest toolset for SQL Server DBAs — we’re now offering the community 154 quality commands! We released the follow two commands in snowball but wanted you to download the latest version of dbatools which includes some really awesome improvements to backup and restore. The restore command is now especially impressive – imagine being able to restore a whole instance of Maintenance Solution backups with a single pipe like Get-ChildItem \\nas\sql\sql2016 | Restore-DbaDatabase -SqlInstance localhost. It’s now totally possible! In case you missed it, we released a really nice Backup-DbaDatabase command. And check out this demo video (includes blooper reel) and accompanying demo code. In this release we have 22 new commands, several bugs fixes and a bunch of improvements. Note that many of these commands were available in snowball but they weren’t officially released with a supporting webpage and additional testing. Gets execution plans and metadata – useful for piping to Export-DbaExecutionPlan. Exports execution plans to disk. Can pipe from Get-DbaExecutionPlan. Get the Query Store configuration for Query Store enabled databases. Retrieves and returns the Query Store configuration for every database that has the Query Store feature enabled. Configure Query Store settings for a specific or multiple databases. Copies the configuration of a Query Store enabled database and sets the copied configuration on other databases. Finds dbatools commands searching through the inline help text, building a consolidated json index and querying it because Get-Help is too slow. Finds Logins in Active Directory groups that have logins on the SQL Instance. Outputs all the active directory groups members for a server, or limits it to find a specific AD user in the groups. Have a developer, DBA or other employee leaving the company and need to know what they own? This command can help. It searches SQL Server to find user-owned objects (ie. not dbo or sa) or for any object owned by a specific user specified by the Pattern parameter. Gets the SQL Server related client protocols on a computer. Gets the SQL Server related server protocols on a computer. We actually release to the gallery a little more often than we blog about. If you’re using Windows 10, have access to the PowerShell Gallery (some corporate networks may not) and would like to be notified about updates, use Watch-DbaUpdate. It’s super cute and tries not to be annoying. It’s also our mascot, Tron’s, debut in the toolkit. You’ll be seeing more of him around, including in an upcoming blog post. Just for fun – checks the PowerShell Gallery for updates to dbatools. Sets up a scheduled task that checks the PowerShell Gallery every 3 hours for updates to dbatools. Notifies once max per release. Removes the scheduled task that checks the PowerShell Gallery every 3 hours for updates to dbatools. Clear all yo SQL connection pools. Simple but good for testing. After 1.0, I’d like to figure out a way to enumerate connections, that’d be cool! We’ll be adding a bunch of SMO Get commands, this is the first of the batch. The Get-DbaDatabase command gets SQL database information for each database that is present in the target instance(s) of SQL Server. If the name of the database is provided, the command will return only the specific database information. Gets the users with local privileges ‘Lock Pages in Memory’, ‘Instant File Initialization’, ‘Logon as Batch’ on one or more computers. Requires Local Admin rights on destination computer(s). Gets the SQL Server related services on one or more computers. Uses backup history to determine how quickly SQL Server is backing up databases to media. Uses master.dbo.xp_create_subdir to create the path. Returns $true if the path can be created, $false otherwise. We’re gettin Enterprise up in here! Thanks to our newest Major Contributor Friedrich Weinmann, we’ve now got a really cool configuration system. This will be helpful for our developers. We’ll have more information in a blog post during the 1.0 redo, but here’s a quick lil overview. Retrieves configuration elements by name. Can be used to search the existing configuration list. Returns the configuration value stored under the specified name. This command is usually only called by functions. This function creates or changes configuration values. These are used in a larger framework to provide dynamic configuration information outside the PowerShell variable system. Whaat! Such good looking logging. Thank you Fred for all of your work on this! Just a reminder: on March 1, 2017, we will initiate a feature freeze. This means that we will no longer be accepting new commands or PRs for new features until we’ve fully implemented all changes that were decided upon for the 1.0 release. A feature freeze is necessary because we invest time vetting each PR and in order to reach 1.0 in a timely manner, we need to focus on bug and style resolutions. We’re asking anyone who can code to help fix the 43 bugs currently filed at GitHub and address the style changes that the community decided upon. We plan to resolve all bug issues first and will continue releasing on a regular basis until the style changes are implemented. 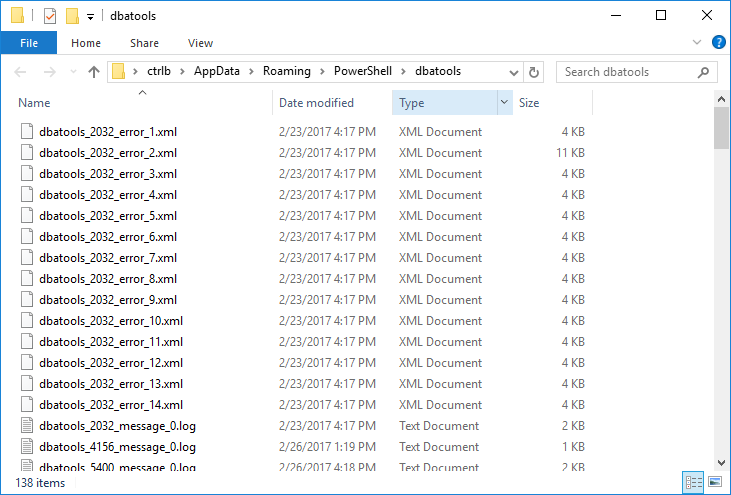 Visit the downloads page for information about how to download and install dbatools (it’s 1 command). Some of these commands are in their infancy. Want to help make them better? Come join the coding party! We’re all hanging out on the SQL Server Community Slack in the #dbatools channel. There’s almost 500 of us there now (but the conversation load is reasonable).